Jason Witten has become Tony Romo’s second favorite target with the Dallas Cowboys. Fantasy owners wanting an elite tight end can figure that Witten is essentially the Cowboys’ 2nd receiver, now that Terry Glenn may or may not return due to injury. That was how Jason Witten’s season played out last year, as he caught 87 balls for just under 1,000 yards and 6 touchdowns. Touchdown totals go up and down and often are as much a matter of luck as anything, so I would look at Witten’s catch total and his yards. Anywhere around a thousand yards is awesome for a tight end, while 87 catches are equally impressive for a player in a receptions league. With that kind of numbers, Jason Witten is just as likely to catch 10 touchdowns as 6 this year. Given the fact there is no certain #2 receiver on the Dallas Cowboys (Patrick Crayton might fill the role), Tony Romo is certain to lean heavily on Jason Witten again. 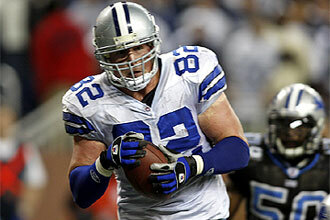 Jason Witten was draft in the 3rd round of the NFL Draft out of the University of Tennessee by Bill Parcells. Parcells claims he wants to draft a tight end every year (and he seemed to do just that with the Cowboys), and he appeared to draft Jason Witten with the intention of making him the next Mark Bavaro or Ben Coates (two other Parcells selections). 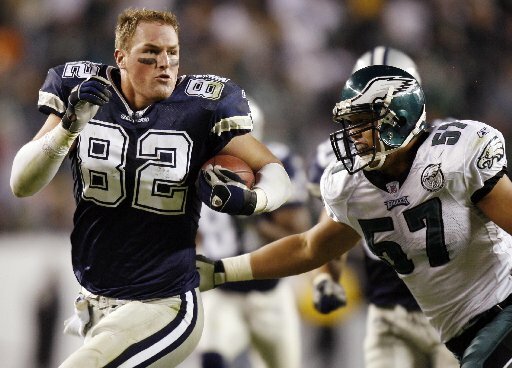 Jason Witten showed his toughness his rookie year, when he played one week after receiving a broken jaw on a hit. Witten had his mouth wired shut, but impressed Bill Parcells by taking the field and playing through the pain. Witten showed flashes his first year. Since that time, Jason Witten has developed into a Top 3 tight end in fantasy football. Witten had a slightly down year two years ago, when it appeared that Tony Romo had trouble finding Jason Witten in his first year as a starting quarterback. Maybe Romo just wanted to throw the deep balls to Terrell Owens and Terry Glenn, and Marion Barber was just finding his way into the offense as a back who caught a lot of passes. Whatever the case, Tony Romo found Jason Witten last year, and Witten had his best statistical season (in yards and catches). There should be more of the same this year. Jerry Jones hinted that he would add a "wow" factor on offense, and many interpreted that to mean a big name 2nd receiver. After failing to trade for Chad Johnson, Roy Williams and Anquan Boldin, Jerry then failed to draft a wide receiver in the NFL Draft, instead collecting running back Felix Jones, cornerback Mike Jenkins and (surprisingly) Martellus Bennett with his first three picks, the Dallas Cowboys came up empty in the wide receiver department. The team is left to hope Terry Glenn returns from injury or Patrick Crayton steps up, though most Cowboys fans believe Crayton is a better #3. Miles Austen is the fastest Cowboys wideout, but few seriously consider Austen as a potential receiving threat. That leaves the Dallas Cowboys needing a viable second option for Tony Romo, and that is likely to be Jason Witten. An iffy receiver situation probably helps Witten, since the Cowboys might have nowhere else to turn. Terrell Owens will command most of the double-teams, so don’t expect to see teams entirely focus on stopping Jason Witten. In the end, defenses would prefer to get beaten by several passes across the middle than one deep pass to T.O. Jason Witten is the top fantasy football tight end with the fewest questions entering 2008. Antonio Gates is recovering from a foot injury, while Kellen Winslow II is battling chronic knee soreness. Witten is coming into his prime years at 26 and he plays for one of the NFL’s top offenses, so there’s a good argument that could be made for Jason Witten going #1 overall among fantasy tight ends. We get the same story in the 2009 fantasy football scene. Jason Witten is still the #1 tight end selection in fantasy sports. In fact, with Terrell Owens out of the way, Witten looks like he’ll be even more of a target for Tony Romo. The Dallas Cowboys have had one of the NFL’s Top 5 statistical offenses these past two seasons. Even with T.O. out of Dallas, the Cowboys still have Tony Romo throwing the ball and Marion Barber running the ball. With Felix Jones, Roy Williams, Tashard Choice and Martellus Bennett likely to be a bigger part of the offense in 2009 than in ’08, it looks like the Cowboys should have plenty of weapons to give defensive coordinators fits. If Roy Williams shows he can be a #1 wide receiver (the biggest "if" in my book) and either Patrick Crayton or Miles Austin comes on as the #2 flanker (I’m thinking Austin might be the big play threat), then the Dallas Cowboys should have a more balanced offense than they have the last two years – Jason Witten should be at the heart of production either way. The only drawback to Jason Witten in 2008 is that he slowed down once he started getting too many nagging injuries. That might be a sign that the additional attention is getting him hit too often. If not, then take Jason Witten as high as you risk in fantasy football drafts, depending on your tight end draft philosophy. Witten will almost certainly be the first tight end taken in 2009 drafts. One last thing: early word out of Dallas Cowboys training camp is that Tony Romo is forcing the ball to Jason Witten more than ever.